Each year since 2005, Sam Adams — you know, the largest American-owned & operated brewery in the world — has created a beer called the “Beer Lover’s Choice” to be included in their “Brewmasters’ Collection” 12 packs. In 2005 it was their Brown Ale, in 2006 the Honey Porter, and in 2007 the Irish Red. So what will 2008’s Beer Lover’s Choice beer be? The choice is between a Blackberry Witbier — brewed traditionally with orange peel & coriander seeds and with a touch of blackberry flavor — and a coffee stout, brewed with smoked malts and aged on a bed of whole Rwandan coffee beans. Click to find out more about the 2008 Sam Adams Beer Lovers’ Choice race, find a tasting session near you & vote for your favorite. Then look for the winner in the “Brewmasters’ Collection” 12 packs later this year. Had both this weekend at the Vermont Brewers Festival, and both were excellent. Yeah, I’m excited to try them myself. 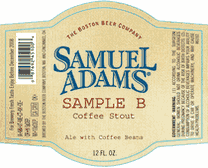 I’m a HUGE fan of coffee stouts in general, and I’m sure their’s won’t disappoint!